Liverpool have now played 38 games in the Premier League since Virgil van Dijk‘s debut, and the Dutchman’s impact on their defensive record is remarkable. 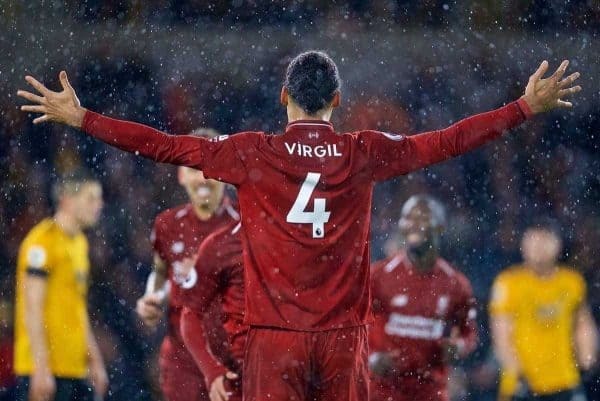 Van Dijk made his first league start for the Reds in a 1-0 loss to Swansea City in January of last year, three weeks after completing his £75 million switch from Southampton. Since then, he has missed just one game in the English top flight, with Jurgen Klopp opting to field Dejan Lovren and Joel Matip for last season’s trip to Huddersfield Town, resulting in a 3-0 win. 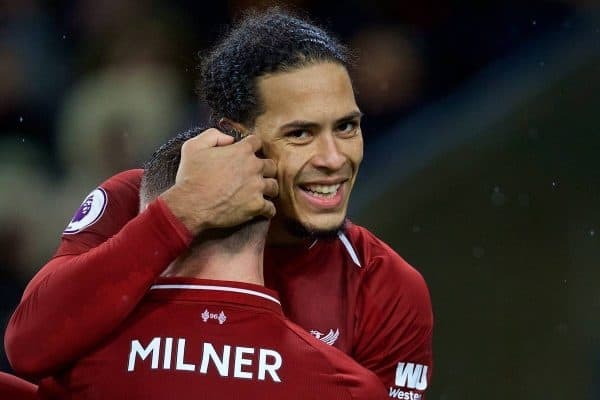 Saturday’s wild 4-3 victory over Crystal Palace marked the 38th game Liverpool have played in the league since Van Dijk’s start at the Liberty Stadium. Despite conceding 3 today, #LFC have only conceded 23 in the last 38 league games. Of those 38 games, Liverpool have won 27, drawn seven and lost just four, scoring 84 goals and shipping just 23, keeping 21 clean sheets, registering a goal difference of +61 and tallying 88 points. Kennett adds that, in averaging just 0.6 goals conceded per game in that space of time, Van Dijk’s presence has led to a significant upgrade on the 1.4 per game in Klopp’s first 18 months at the club, and the 1.2 in the first half of last season. To put this into context of a 38-game season proper, with the league switching from 42 games in 1995/96, 88 points would have been enough to win the title in 13 of the past 23 campaigns. It would have clinched pole position in three of the previous five seasons, but not in either of the past two, with Chelsea champions with 93 in 2017/18 and Man City setting a record with 100 last time out. Only four times has a side conceded fewer goals in a 38-game season, with Chelsea and Man United letting in 22 in 2005/06 and 2007/08 respectively, Arsenal shipping 17 in 1998/99 and Chelsea conceding just 15 in 2004/05. Liverpool’s best defensive record since the Premier League began saw them concede 27 in 2008/09, while their tally since Van Dijk’s debut is less than half that of their last title challenge in 2013/14 (50). The Reds also conceded 50 in Klopp’s first season with the club in 2015/16, and 42 in his first full campaign at Anfield in 2016/17. Encouragingly, the only side to concede 23 or fewer in the English top flight and not go on to be champions was Arsenal in 1998/99—with all three to do so in the past 19 years lifting the title. While six sides have kept more clean sheets in a 38-game season, including Liverpool in 2005/06 (22), none have kept 21 or more since Chelsea (22) and United (24) in 2008/09; 10 years ago. Of course, it is salient to note that extrapolated data means nothing with regards securing the title in May. 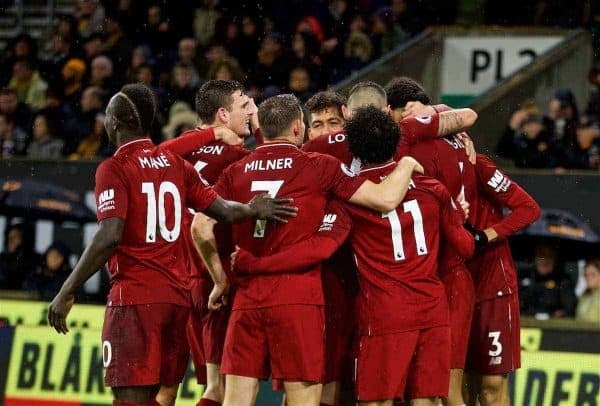 But with Liverpool having improved even further this season, to the point in which they are currently on course to score 89 and concede 22 with a goal difference of +67, keeping 22 clean sheets and tallying 99 points, it is very impressive. Van Dijk is not the only contributing factor, but the £75 million to take him from St Mary’s just over a year ago is proving to be a genuine bargain.